On the heels of a highly successful 2016, Barrett-Jackson Auction Company has set the stage for another incredible auction at Mohegan Sun. As the newest auction on the Barrett-Jackson calendar, the Northeast Auction at Mohegan Sun in Uncasville, CT has quickly reached popularity among car collectors. In fact, last year’s inaugural Northeast Auction was the first double sell out in company history and featured three record breaking sales. The 2017 Northeast Auction, June 21 – 24, will feature hundreds of vehicles and more than 500 pieces of automobilia, with most selling at No Reserve. Barrett-Jackson expects another sell out, and for those who are unable to attend in person or secure tickets, Proxibid will be the exclusive provider of online bidding at this and all Barrett-Jackson auctions. Interested buyers can register to bid online by visiting the auction catalog on Proxibid. A “New” 1970 Mustang Boss 429: This incredibly rare vehicle boasts just 10 test miles on the odometer, having undergone a recent restoration. 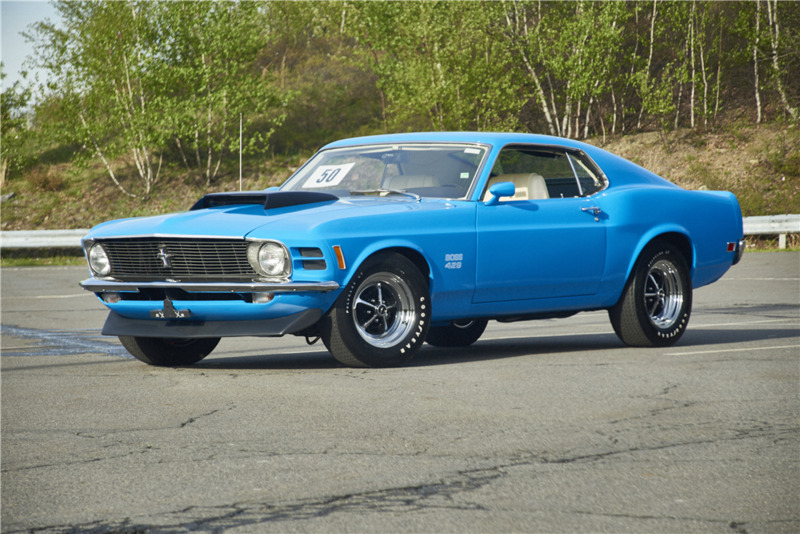 Finished in Grabber Blue, the Boss 429 received a score of 944 of 1,000 from the MCA. 2017 Ferrari 488 Spider: One of the world’s most desirable supercars, the 2017 Ferrari 488 Spider can usually only be purchased through a lengthy waitlist. This auction is a rare chance to own this example, finished in Corsa Red with just 77 miles on the odometer. 1966 Shelby GT350-H Fastback: Less than 1,000 Shelby GT350s were built in 1966, and only 59 were finished in Ivy Green. Produced as part of the renowned Shelby/Hertz collaboration in the 1960s, this car has undergone a complete restoration to its former glory, and features a three-speed automatic transmission. 1977 Porsche Carrera 3.0 Targa: An incredibly rare 3.0 Targa built in left-hand drive, this car is a must-have for American Porsche collectors. It features a five-speed manual transmission, 3.0-Liter engine, and will cross the auction block at No Reserve. 1968 Chevrolet Corvette 327/400 Custom Coupe: Selling at No Reserve, this ’68 Corvette is a show stopping custom from the outside, but a classic Corvette under the hood. While the front of the car was created from an upside-down Camaro nose piece, the car is fitted with a period-correct 4-speed manual transmission and classic 327 small block engine. For more information on this auction, read our latest press release or visit the auction catalog on Proxibid.